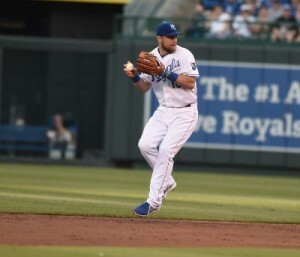 Ben Zobrist, star utility fielder (he can play six positions) for Kansas City Royals baseball club, has made an impact with his new team since being traded mid-season from the Oakland Athletics. Helping make the playoffs has proven his worth. Ben is a devoted family man and a very active Christian who loves sharing the Gospel of Christ with others. Ben spent time with church and family activities. He was also involved with sports and school activities. Ben and his friends constantly spent time playing whiffle ball in the Zobrist’s backyard, make-shift, ball field, with backstop and all. There, he developed his competitive edge and started his switch-hitting. Zobrist, a 2 time American League All-Star (2009 and 2013), was an excellent athlete in several sports besides baseball, especially basketball. He and his friends spent hours playing inside in the winter at his father’s church. His last year in high school Eureka went undefeated until the last game of the sectionals. Baseball was the sport that started to come together for Ben in the middle school. Craig Gerdes was the middle school coach who took his team to state in Ben’s 7th grade year (4th place) and 8th grade year (3rd place). As a freshman in high school, Ben made the varsity team, and he jump started four outstanding years at Eureka High School under his coach Bob Gold who comments, “Ben was a good player, real smooth and an excellent hitter. It culminated in his senior year, and he had a great season to finish his high school career.” Gold also had an impact on Ben as adult leader for the Fellowship of Christian Athletes huddle group at school. Ben was an excellent student, and he was hoping to go to college on a baseball scholarship. He received no baseball scholarship offers despite his great senior season. Plan B was to go to his father’s alma mater, Calvary Baptist College, in Kansas City, MO, where he could play basketball. 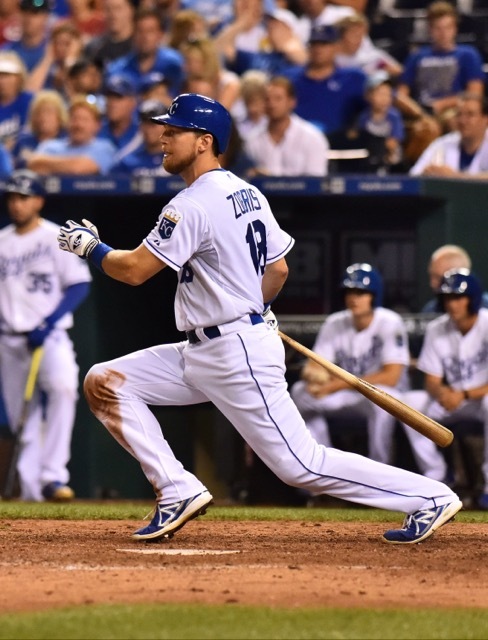 However, the Lord had not cancelled out Plan A.
Zobrist accepted that he would be heading to Kansas City to college when an unexpected phone call from Coach Gold saying a baseball try out will be held in a small town west of Peoria. Gold assured Ben there would be scouts and college coaches in attendance. Ben still having the desire to play baseball went to the tryout. It was pretty simple with each player doing a little of everything, fielding ground balls, hitting, throwing, pitching. Having just returned from a church conference whose theme was “Keeping the Door of your life open to what God maybe wants you to do, regardless what it is,” Ben decided that was where God was leading him. Olivet offered a full baseball scholarship. Ben, a ten year major league veteran with a career batting average of .265 with 127 homeruns and 567 runs batted in (RBI), played three years at Olivet. Each summer he played ball. One summer he played and shared his testimony through Athletes in Action in Central America. The summers of 2002 and 2003 Ben played in the Northwoods Summer League for the Wisconsin Woodchucks in Wausau, WI. Ben needed to see just how good he was, and he did that by transferring to Dallas Baptist University where he would face stiff competition for his senior year. Ben went quickly through the minor leagues. He was traded in the middle of the 2006 season from the Astros to the then Tampa Bay Devil Rays’ organization. Tampa Bay called him up to the major league team from Triple A Durham (N.C.), and Ben made his big league debut on August 1st (2006). 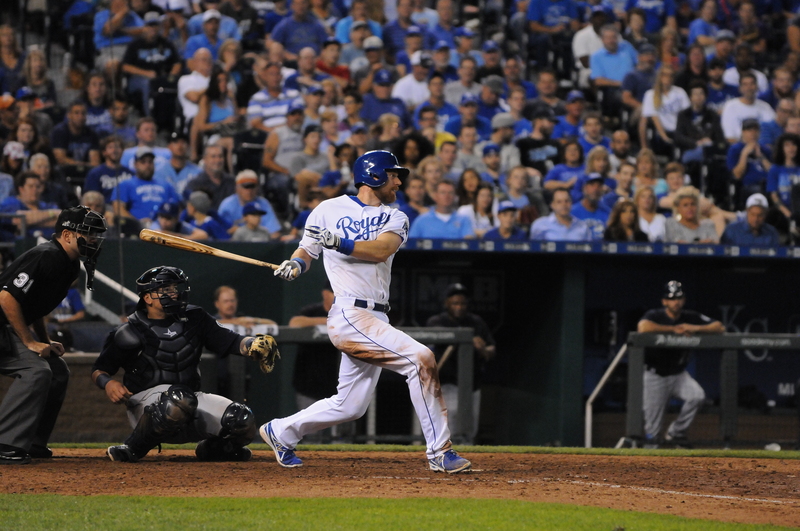 Mid-season this year the A’s sent Ben to the Kansas City Royals who are now in the World Series. Ben has had some good years statistically, but 2009 sticks out as Ben’s best season for the (now) Tampa Bay Rays when he batted .297 and hit 27 home runs and knocked in 91 batters (RBIs). Ben has been a consistent fielder and hitter over the years and that makes him a valuable player. After the 2014 season he was traded to the Oakland Athletics. Mid-season this year the A’s sent Ben to the Kansas City Royals who are now in the World Series. Ben went to the World Series with the Rays in 2008. There are two things more important to Ben than baseball. They are faith and family and friends. His faith in God through his loving Savior, Jesus Christ, takes the top spot. However his family and friends are a close second. He has always been close to his parents, grandparents and siblings. During all the ups and downs and even the good seasons, Ben had another close family member by his side, his faithful companion and wife, Julianna. Ben shares, “Julianna has been just a wonderful, supportive and loving wife, having to ‘roll with the punches’ with all the travel and away time.” Julianna is a professional singer of Christian music. Both Ben and Julianna have been supportive with things they love individually. She graduated from Belmont University, noted for music education, and they have their off season home near Nashville to allow her to stay in touch with friends and colleagues in the music industry.